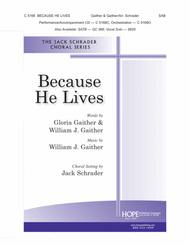 Composed by William & Gloria Gaither. Arranged by Jack Schrader. Easter, Funeral. Octavo. 8 pages. Published by Hope Publishing - Digital (H1.C51686DP). Scriptural Reference: Jeremiah 29:11 - John 14:19 - John 20:1 - John 20:2 - John 20:3 - John 20:4 - John 20:5 - John 20:6 - John 20:7 - John 20:8 - John 3:16 - Luke 1:31 - Luke 24:1 - Luke 24:2 - Luke 24:3 - Luke 24:4 - Luke 24:5 - Luke 24:6 - Luke 24:7 -. 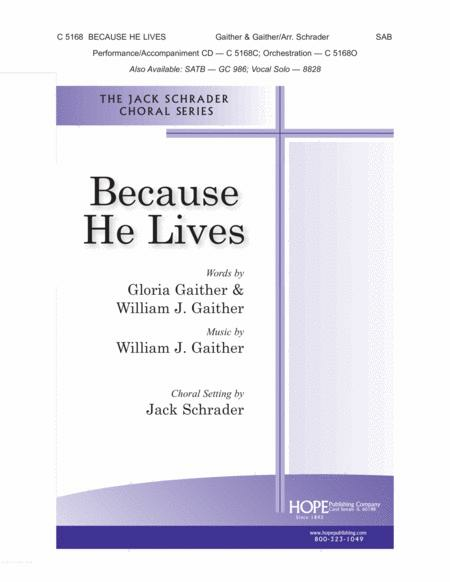 The 'classic' Gloria & Bill Gaither song is showcased in this gleaming, artistic arrangement by Jack Schrader. This standard favorite has been given a fresh, dignified treatment and should meet the needs of many choirs during the Easter/Lenten season, as well as many other Sundays throughout the church year. The orchestration consists of a Conductor's Score and parts for: Flute, Oboe, Clarinet, Trumpets 1, 2, & 3, Horns 1 & 2, Trombone 1, 2, and 3 (or Sub. Tuba for Trombone 3), Percussion, Timpani, Harp, Violins, Violas, Cellos, and Basses.